Kent is a county that's never really featured very highly on my list of places to visit, but with my sister getting married there on Saturday it seemed like an ideal opportunity to at least give the place a chance. I'd heard good things from her about Oare Marshes so we travelled down early Friday morning to sneak in a few hours birding before my family duties began. Believe me when I say that the sight of the Swale estuary was a very welcome one after having spent four hours driving on what must count as some of Britain's most boring motorways (M4 and M25 I'm looking at you). With no clear idea of where was best to head, we simply set off along the sea wall to do a loop of the main reserve. The reeds on our landward side were alive with Linnets, Goldfinches and several large flocks of Starlings as well as a couple of Reed Warblers (what was that about me never having much luck finding them?) and brief glimpses of a Sedge Warbler. Reed Buntings were also numerous with all of the individuals we saw being either female or juvenile birds. Out on the Swale a few Ringed Plovers were poking their heads above a muddy bank but it was to the sky that our attention was rather abruptly drawn. 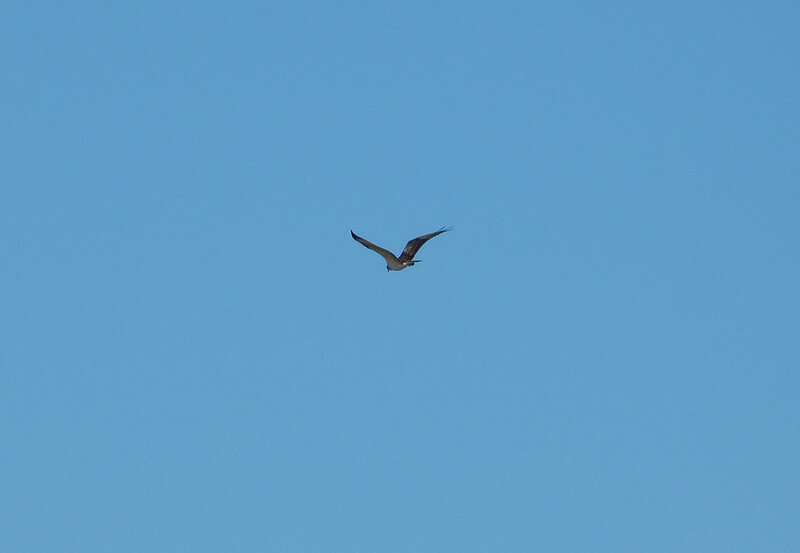 We'd only been there for a little over twenty minutes and here was a magnificent Osprey heading straight for us! Momentary paralysis was quickly overcome as I whipped out my camera and fired off a couple of shots at its now retreating form. It was clearly looking down to the water but a constant barrage of attacks from the resident gulls precluded any hunting attempts. What a bird though and definitely a case of being in the right place at the right time. Following the excitement a spot of lunch seemed necessary, so we retired to a nearby hide which at least offered some respite from the unrelenting heat. Let me assure you that the green and lush hills of Wales had never seemed so distant from amongst the parched landscape of the south. Rather embarrassingly we somehow managed to miss a flock of 59 Avocet's roosting on the mud in front of us, an error only rectified after overhearing someone else in the hide talking about them. I blame the heat. Moving on we came to the east flood which was packed with thousands upon thousands of waders. I'll leave exact counts to the sadists out there but my rough estimates came in at over 900 Redshank, 1500 Black Tailed Godwit, 91 Lapwing, 600 Golden Plover and 7 Ruff. Dotted amongst them were singles of Greenshank and Little Egret as well as a few eclipse plumaged Teal and yet more Starlings. We also spent a long time deliberating over a small wader which we eventually recorded as a juvenile Curlew Sandpiper. It should have been much simpler to pin down given that we knew a couple were present, but I get so little opportunity to observe the species that I never feel confident in going with my first instincts and proceed to second guess myself into oblivion. I'd have loved to get it on camera but the light was in the wrong direction and distances too great, so instead here's a couple of general views showing the gathered birds. Crossing to the west side of the reserve we spotted a Green Woodpecker making itself scarce before arriving at a hide that was doing a passable impersonation of a sauna. Our brief ensconcement within delivered a Green Sandpiper and a large but unidentified green caterpillar, and no I don't know if you had to be green to appear there. 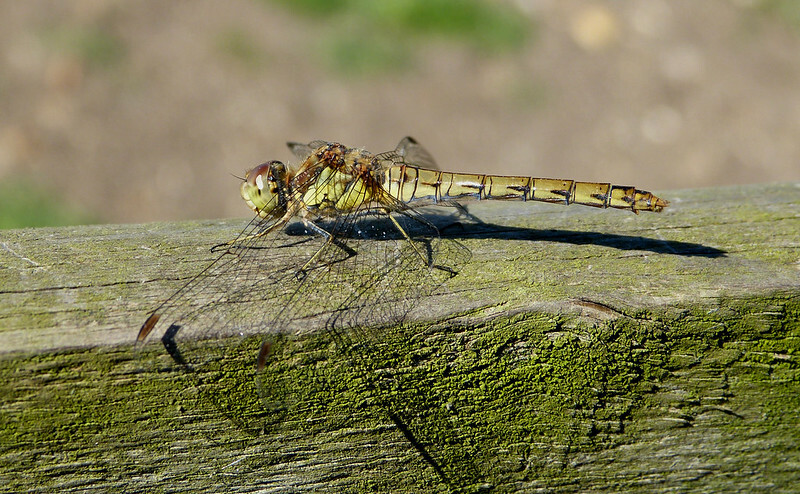 Outside dragonflies were everywhere, as indeed they had been across the site, but this Common Darter was one of the few I saw settled. A quick stop at the church to check on preparations didn't take long given that it borders and overlooks part of Oare Marshes, so it was off to the RSPB's Elmley reserve next. We only had chance to drive along the lengthy approach track, but even that was enough to deliver at least three hunting Marsh Harriers and a Yellow Wagtail. 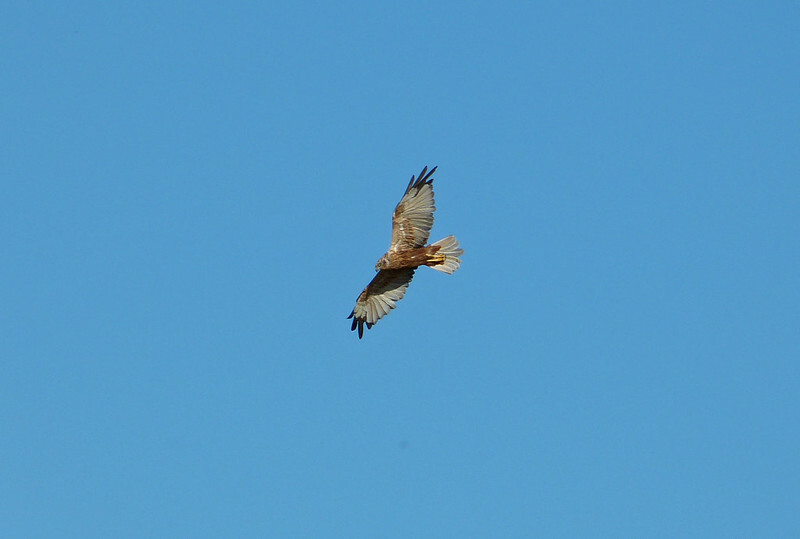 Five more Marsh Harriers were soon in sight as we approached our cottage for the weekend at Ferry House, a couple of which were at times flying right next to the car. I just about managed to grab my camera in time to take this image, but of course by then the bird had moved a lot further away. 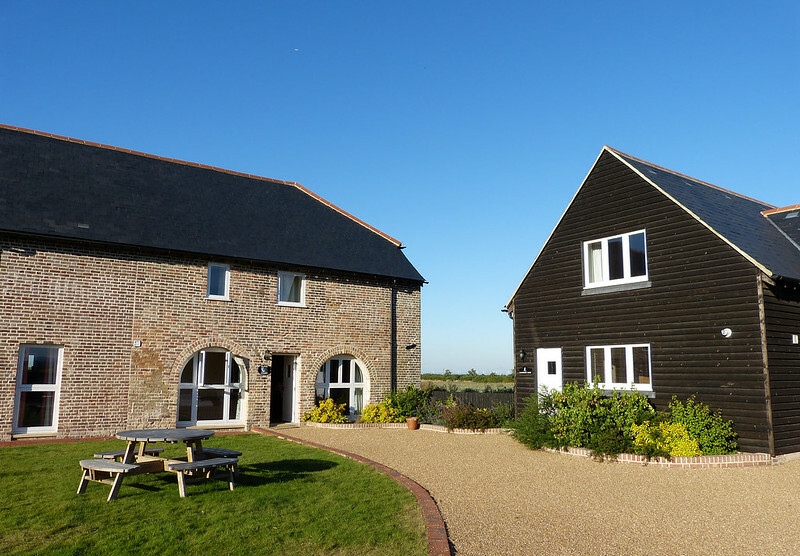 The cottages themselves turned out to be a series of stunning converted barns surrounded by open farmland for as far as the eye could see. After such a great day it was hard to imagine that things could get any better, but somehow the natural world managed to pull something extra special out of its bag of tricks. As night fell a Barn Owl started to call from a modern barn located just across the yard from our cottage, an activity which continued for several hours. I poked my head through the door but couldn't see anything in the almost total darkness, so instead recorded some audio for you to enjoy. I had hoped to see the owl out and about early next morning but it would appear that my definition of 'early' is not really adequate. A couple of our guests who went for a run at six reported seeing a Barn Owl hunting nearby whilst another was perched in the barn, so perhaps our noisy individual was a juvenile calling for food. Having listened to various calls on the internet it certainly sounds highly likely. WOW your sis really turned you onto a great spot amazing variety of birdlife..and some super photos to show for your trip!! That Owl call is nothing like I thought it would be...I would never put that sound with an owl. Congrats to the bride! Nice photography Adam and a very comperehensive write up of your birding day out. All those waders to look through too, I would be spoilt for choce in which way to look, and always good to get pics of Osprey and Marsh Harrier. i think you must have been in another country not just another county to get that heatwave. Lovely Kent, there are plenty to do, birdwatching. Your photography is great. Great post and great shots!! Boom & Gary of the Vermilon River, Canada. So does this mean you will be going back to Kent some other time? Great photos. Wow, that's a lot of birds to look at. 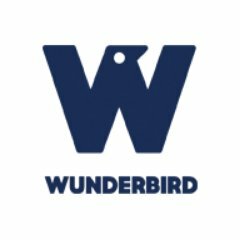 Great birds and wonderful photos. Looks like an awesome place to bird. Thanks for sharing. 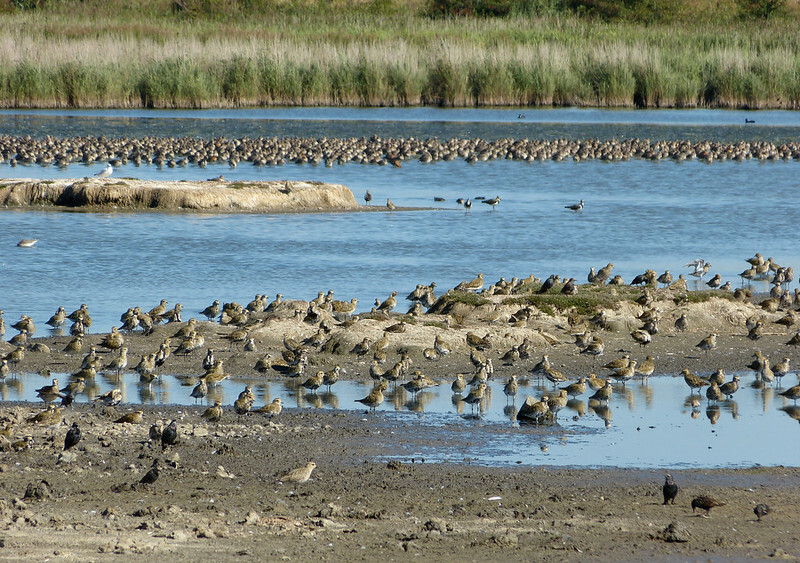 Wow, look at all those shorebirds! Love the harrier shot! Beautiful photos, Mick! My apologies! Obviously, you are Adam, not Mick. Maybe I need some coffee! A great series of photos and I would love to see all those shorebirds. Oh well, "ours" are on the way south now. Really love the shot of the harrier. Oh my goodness...just look at all those birds...I love the panoramic view. Thanks all for your very kind comments.